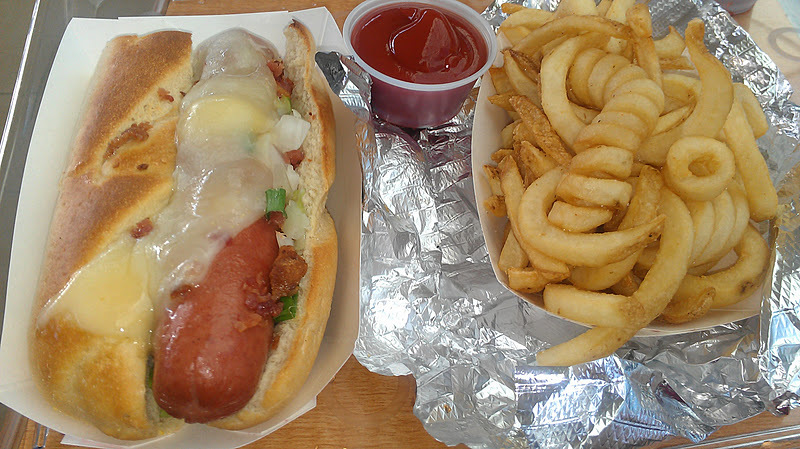 Mami-Eggroll: Spike's All Beef Hotdogs and More! 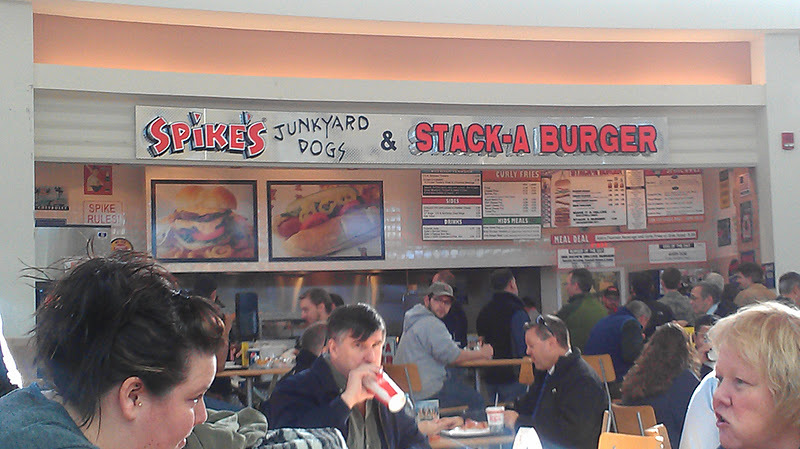 Spike's All Beef Hotdogs and More! In addition to my love for fried chicken wings and eggroll, my next favorite thing is hotdogs. With hotdogs, I’m not picky. I love all types of hotdogs, ranging from the cheap processed meat store brand hotdogs to the pricey Pearl ¼ pound hotdogs from the deli section. Although I prefer them grilled, I can eat them boiled, pan fried, steamed and even MICROWAVED! So easy to make yet so satisfying! As a quick and cheap lunch, I like to get the ¼ Pearl hotdogs at Burlington Cold Cut Center for $2.00 or one from Roche Brothers in Woburn for $1.50 with all the fixings. 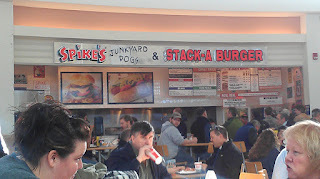 I was definitely excited when I saw that they had opened up a Spike’s Junkyard Dogs at the Burlington Mall in mid November. The menu offer a variety of burgers with your options of single, double, triple or more patties, and hotdogs with endless toppings of cheese, chili, bacon, vegetables and sauces. If beef or pork Is not what you are craving, the menu boasts chicken sandwiches, both grilled or fried and chicken tenders. Sides includes curly fries, also available with cheese, chili and bacon among other toppings and onions rings. I got the hotdog special of the day which was the “Gary” hotdog with swiss and cheddar cheese and bacon. I was persuaded into upgrading to a combo that came with a small drink and regular curly fries. Total was about $7.50. I added additional condiments at no extra charge, Onions, scallions, and lettuce. Ketchup, mustard, and another red condiment that looked like sweet relish was self-serve at the pickup station. 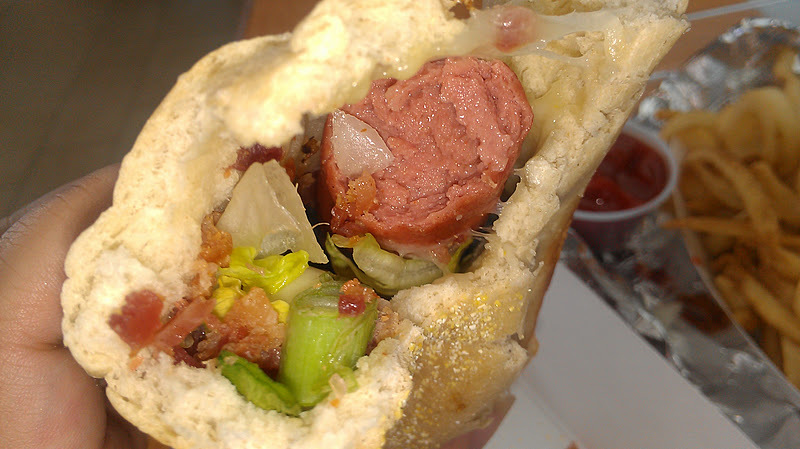 The hotdog was huge and tasty! The fries were a bit soggy and could have been more crispy. 2011 Recap - Weddings, Babies and Vacations!